The two-handed sword has been used since the fourteenth century in medieval Europe. It was a weapon of war for fully armored soldiers between 1350 and 1550. From the sixteenth century onwards the weapon remained in use for sporting fights and chivalrous duels. It was possible to use this sword with two hands for extra power behind a thrust. This sword is a replica of original Oakeshott type XVIIIe swords. This type of swords was used from around the mid-fifteenth century to the beginning of the sixteenth century. Typical for this sword is that the blade starts narrow at the guard and then starts wide again and extends very narrow to the tip. The grip is suitable for one and a half hands and two hands. 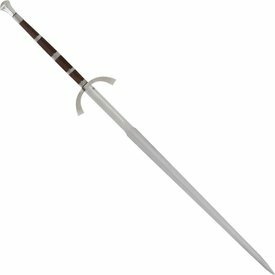 This sword is made from a high quality spring steel with a hardness of 50-55 ° Rockwell. It has a wooden grip with steel fittings and a sharp blade and tip.